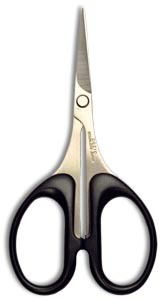 ANVIL SCISSORS These premium scissors are manufactured in the USA of stainless steel which is "Ice Tempered" for extra cutting life. Their vinyl coated handles easily adjust to fit any fingers. The Anvil Mini scissors feature super short cushioned handles for ultra control -"Ice Tempered" stainless steel construction - and have one blade micro serrated for precision non-slip cuts. Long regarded as the "work horse" of fly tying, the Ultimate scissors feature user adjustable cushioned handles and "Ice Tempered" stainless steel blades. The standard model has one micro serrated blade for precision non-slip cutting while the new "double serrated" model has two. Anvil Long Reach 4 ¼"
The Anvil Long Reach features user adjustable cushioned handles, "Ice Tempered" stainless steel construction, and one micro serrated blade for non-slip precision cutting. Same as the Anvil Long Reach, but with an offset handle. 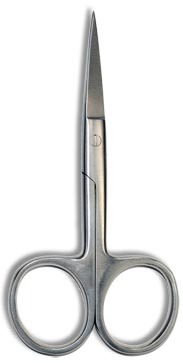 DR.SLICK scissors have been popular favourites among our fly tying customers for many years. Each pair is carefully inspected, adjusted and tested before leaving the Dr. Slick shop, assuring you of a high level of quality and performance. All scissors are made from 410 Japanese stainless steel with a Rockwell hardness of 45, except the Razor scissors which are made from 440 J2 stainless steel with a Rockwell hardness of 55. Most scissors in the DR.SLICK line can handle both natural and synthetic materials with ease, but if you tie predominantly with synthetics, consider the new generation of scissors like the Tungsten Carbide, or Razor models that are designed to handle these materials. 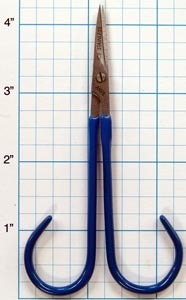 If you tie small flies without much mass or material, use small finer blade scissors like Arrow, MicoTip and Iris. 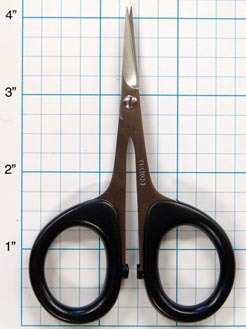 Scissors with heavier blades like All Purpose, Hair or Razor are better suited for larger flies with more mass and material. Gold loop handles and serrated blades. Available in either curved or straight blades. Black loop handles. Not serrated. 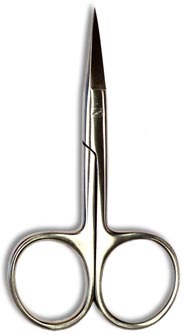 From the makers of Dr. Slick, an economy version of the Arrow scissor. Made from 400 grade stainless steel. 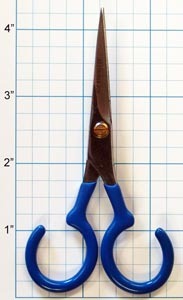 From the makers of Dr. Slick, an economy version of the All Purpose scissor. Made from 400 grade stainless steel. From the makers of Dr. Slick, an economy version of the Hair scissor. Made from 400 grade stainless steel. 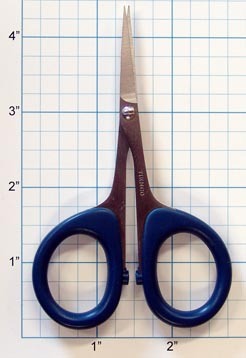 Especially made to cut through deer hair comfortably and evenly. Oversized finger holes. 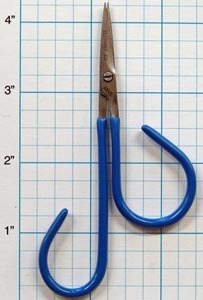 4.25"
For the tyer who wants one all-purpose scissor, this model offers an extra fine point for precise trimming. In addition, the comfortable, closed plastic finger loops make for precise control during use.